Space shuttle Atlantis is slowly towed from the Shuttle Landing Facility to an orbiter processing facility at NASA's Kennedy Space Center in Florida for the last time. Atlantis' final return from space at 5:57 a.m. EDT secured the space shuttle fleet's place in history and brought a close to the America's Space Shuttle Program. WASHINGTON — More than 1,000 workers at companies that worked on the space shuttle program will leave their jobs for good in August. While at least one major space shuttle contractor is laying off more employees than it projected in the lead up to last month’s final space shuttle mission, at least two — Houston-based United Space Alliance (USA) and Chicago-based Boeing — will issue fewer pink slips in August than initially predicted. USA, which laid off 1,550 workers immediately following the final space shuttle mission’s July 21 landing at Kennedy Space Center in Florida, will lay off another 515 Aug. 12, spokeswoman Kari Fluegel told Space News Aug. 3. Most of these will come out of Houston. “On the 12th of August, that’s going to be our biggest layoff in Texas,” Fluegel said. USA expects to lay off approximately 285 more employees in Houston, Huntsville, Ala., and Huntington Beach, Calif., by the end of August, leaving a company that once employed 10,500 with just over 3,100 employees. USA had notified nearly 2,900 employees in mid-May that they would be laid off between late July and the end of August. Some of the notified employees, however, either found new positions within the company or left USA ahead of the layoffs, Fluegel said. USA’s parent companies, Boeing and Lockheed, also plan to lay off more shuttle workers in August, representatives of both companies said. “Right now on Friday we think the number’s around 260,” said Boeing spokesman Ed Memi. He referred to a spate of nationwide layoffs of Boeing shuttle employees slated for Aug. 5. As recently as early June, the company had been planning to let go almost twice that number — 510 people — on that date. Memi said that some of those who were to be laid off took positions in other Boeing divisions. Others received temporary assignments from the company, and some quit ahead of the layoff date. Most of the workers who were to leave Boeing on Aug. 5 were based in Houston. Meanwhile, a significant chunk of Lockheed Martin’s shuttle-related layoffs is coming out of NASA’s Michoud Assembly Facility in New Orleans, where the Bethesda-based contractor manufactured and refurbished the space shuttle fleet’s enormous orange external fuel tanks. Of the remaining 300 Lockheed employees at Michoud, 200 will stay on to work on the Orion Multi-Purpose Crew Vehicle. 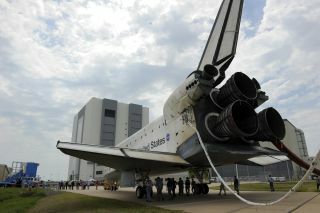 The other 100 “will be closing out shuttle contracts for another six to 12 months,” LaNasa said. WARN Act notices filed with the state of Louisiana show that 160 workers are to leave Lockheed Aug. 26. WARN is short for Worker Adjustment and Retraining Notification. A WARN Act notice is a federally mandated layoff disclosure. It requires companies to provide written notification 60 days in advance of a layoff or facility closing. Other aerospace companies also are shedding shuttle workers. According to WARN notices filed by Pratt & Whitney Rocketdyne with Florida, 67 employees at the Kennedy Space Center are to be laid off between July 29 and Dec. 15. Pratt & Whitney Rocketdyne of Canoga Park, Calif., manufactured the reusable space shuttle main engines. The company also holds a NASA contract for the development of the J-2X, an upper-stage engine derived from Apollo-era technology. The next NASA-owned rocket, the congressionally mandated Space Launch System, would use a cluster of three to five space shuttle main engines for its core stage and a J-2X for the upper stage. Pratt & Whitney Rocketdyne has 15 fully assembled space shuttle main engines remaining in its inventory. Another two engines could be certified for flight, Karuhn said. Alliant Techsystems (ATK) laid off 100 workers the week of Aug. 1 in its latest round of shuttle program layoffs, spokesman George Torres said. ATK made the space shuttle’s four-segment solid rocket boosters and is working on a five-segment version of those motors for the Space Launch System. Torres said ATK has lost about 1,600 jobs as a result of the shuttle program ending. Meanwhile, just before Congress began its August recess, Rep. Sandy Adams (R-Fla.)introduced legislation that aims to attract new employers to Florida’s Space Coast. Her proposal, known as the “Shuttle Workforce Revitalization Act of 2011” (H.R. 2712), would, in certain situations, give preferential treatment to small businesses in Brevard County, Fla., that are seeking federal contracts. The Kennedy Space Center, the U.S. government’s main civil spaceport, is located in Brevard County. Adams’ bill was referred to the House Small Business Committee. No consideration of the legislation is possible until early September, when U.S. lawmakers return from their traditional summer recess.